Had a fun day out with the kids and the dog(! 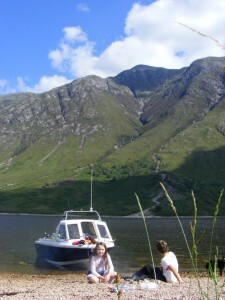 ), spending as much time cruising about and lazing ashore in the sunshine as we did fishing. 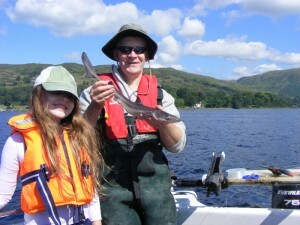 Even so we managed 26 spurdog, mainly small but with the biggest at 6.75lbs being caught at the last minute by Mike. Funnily enough we caught nothing but spurs – no mackerel, whiting, LSD or thornies – which is a first for me. Most of the fish came a long way up the loch, about 2-3 miles from Glen Etive, where the bottom was carpetted with small spurries. It was Katie’s first time out in the boat, but she was quite happy steering us around, and managed to keep a respectably straight wake most of the time. Less said about the dog the better – she demanded to be treated as a lapdog most of the day and also managed to bring a motley collection of ticks aboard after we stopped ashore for lunch, much to Katie’s disgust. Only downer of the day was losing a tyre at Crianlarich on the way home – the valve blew out (a new one on me), but it took only a few minutes to change to the spare, so not really much of a drama.